Bob Giloth's Blog: Becoming Serious? "Becoming serious was not the same thing as approaching truth, I sensed, however vaguely." "...I define a mistake as a decision, an action, or a judgment that is less than optimal, given what was possible to know at the time." Paul J. H. Schoemaker, Brilliant Mistakes: Finding Success on the Far Side of Failure. 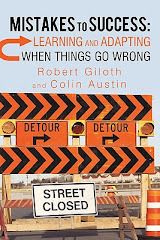 Approaching truth is about curiosity, incremental learning, and learning from mistakes. We can't help but take this seriously, at the same time knowing that posturing seriousness won't get us far. And it all feels a bit fuzzy, so we better throw in some humility. And avoid truthiness. Labels: failures, lessons, mistakes, seriousness, truth, truthiness.